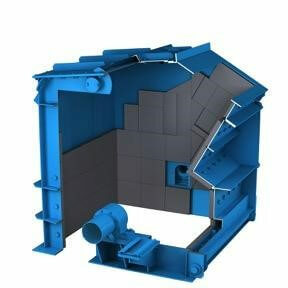 The impactor's versatile design can solve many size reduction problems. Stedman is a leading HSI crusher manufacturer, and these products have proven they are capable of size reduction of all types of material sizes and hardness with minimal maintenance and excellent cubical particle size distribution control. Learn more by downloading the "Expect More from your Horizontal Shaft Impactor" Technical Article. All varieties feature externally fed horizontal rotors with breaker bars, which propel material into a series of apron mounted breaker plates that crush or pulverize many different types of materials to specified degrees of fineness. Reduction ratios of up to 30:1 are achievable in a single stage. HSI applications have gone beyond soft and nonabrasive materials to harder minerals thanks to the introduction of alloy steel rotor breaker bars. 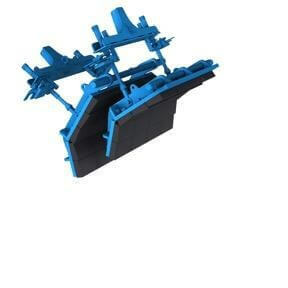 Feed enters the primary crushing chamber and meets the rotor breaker bars, which impel the feed against the first apron lined with breaker plates. Material is reduced in the primary chamber and passes by the front apron breaker plate gap, entering the secondary and, in some, the tertiary chambers for further reduction. 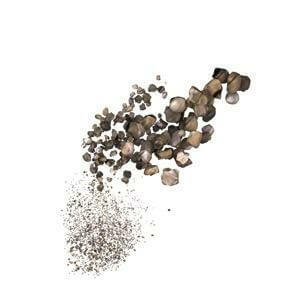 Impact with the rotor, the plates and each other contributes to the particle size reduction. A high percentage of the initial size reduction comes from the first impact with the rotor breaker bar. Aprons are shaft suspended at the front and from a spindle in the rear, allowing for continuous gap adjustment as wear progresses. Material is efficiently processed at high rates for low costs. The spacing between rotor breaker bars and breaker plate aprons can be adjusted to produce different products within one crusher. Gap adjustment between the rotor breaker bars and breaker plates by manual or computer controlled systems adjusts the crushing gap so that product particle size distribution remains constant. The mineral processing industry usually evolves rather than revolutionizes, but the Horizontal Shaft Impactor (HSI) has revolutionized the crushing process in numerous industries. There are several varieties of HSI, and their similarities are more numerous than their differences. Our Mega-Slam primary impact crushers and Grand-Slam secondary impact crushers are top of the line and low maintenance horizontal shaft impactors. All varieties feature externally fed horizontal rotors with breaker bars, which propel material into a series of apron-mounted breaker plates that crush or pulverize many different types of materials to specified degrees of fineness. In 1946, Dr. Erhard Andreas of Muenster, Germany, patented the “Andreas Impact Crusher System.” His design utilized old torpedo tubes and steel from decommissioned tanks. Since then, there have been many unique features of the design patented, but they all operate similarly. This article reviews current techniques employed to get the most from this versatile design. Reduction ratios of up to 30:1 are achievable in a single stage. The simple design offers low capital and operating cost. Low headroom requirements make it easy to install. Product sizes may be varied by changing rotor speed and the clearances between rotor breaker bars (also called blow bars or hammers) and apron breaker plates. HSI applications have gone beyond soft and nonabrasive materials such as limestone, phosphate, gypsum and weathered shales, to harder minerals thanks to the introduction of alloy 1 steel rotor breaker bars. Typical alloy steels contain manganese and/or high or medium chromium content. 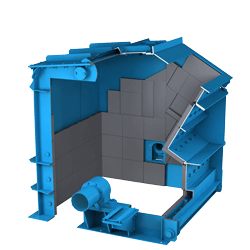 There are many different crushing chamber designs on the market, and proper selection will depend on the knowledge of the application for proper feed, crushing chamber configuration, metallurgy of the crushing chamber components, gap setting and rotational speed. Finally, computer controls can automatically adjust HSI settings on the fly to adjust for wear or changing specs. 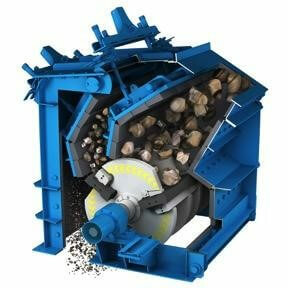 HSIs have a lined crushing chamber with rotating breaker bar rotor on a horizontal axis. The size reduction takes place quickly along short fracture lines, producing a more cubical product to meet aggregate specifications. This fast impact fracture is different from the slow compression breaking in cone or jaw crushers that produce more slabby or flat material (5 to 1 length to height ratio). 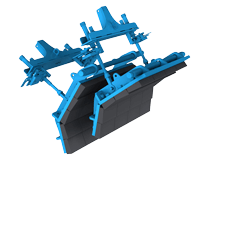 Feed enters the primary crushing chamber and meets the rotor breaker bars, which impel the feed against the first apron lined with breaker plates. Impact with the rotor, the breaker plate, and inter -particulate collision all contribute to comminution. Material is reduced in the primary chamber and passes by the front apron breaker plate gap, entering the secondary and, in some configurations, tertiary chambers, for final reduction. A high percentage of the initial size reduction comes from the first impact with the rotor breaker bar. Aprons are shaft suspended at the front and from a spindle in the rear, allowing for continuous gap adjustment as wear progresses. Unlike hammer mills, the open discharge impactor has no screens or grates holding material inside the crusher; material is efficiently processed at high rates for low costs. The rotor breaker bars operate best at specific speed ranges for maximum results. As the total processing capacity and rotors get larger, the number of breaker bar rows increases. On smaller sizes, there are only two rows; on larger rotors, there are four or more rows of rotor breaker bars. The optimum configuration has material delivered to each row of rotor breaker bars in a continuous bed over the width of the rotor for optimum performance and consistent wear part utilization. Some rotor interiors are open, and some are closed depending on feed conditions. For example, concrete recycling requires a Stedman Machine Company • 1-812-926-0038 • www.stedman-machine.com 2 closed rotor so rebar doesn’t get entangled. The HSI is used for all types of material with compressive strength less than about 20,000 pounds per square inch. It’s widely used for sand and rock for roads, railways, reservoirs, electrical grid isolation, building materials and many industrial applications such as metal reclamation and recycling. Wear part metallurgy is critical to proper applications and performance. It’s a good idea to keep a log of these items to determine the best wear part selection and maintenance schedule: feed and discharge information, throughput rates, change out records and measurements of worn parts. Proper selection of wear part metallurgy will result in optimum production rates; longer maintenance cycles and fewer changeouts, which reduce costs in labor, increase the wear part’s life as well as reduce downtime. 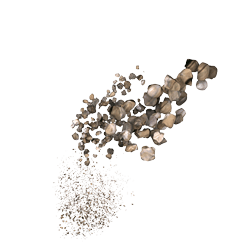 Materials with high moisture content can be successfully handled by using heaters and air cannons to reduce and dislodge material adhering to the crushing components and chamber. The spacing between rotor breaker bars and breaker plate aprons can be adjusted to produce different products within one crusher. It is possible to crush soft raw material limestone or high-grade harder limestone for cement or asphalt applications with one crusher by externally adjusting the breaker bar and plate settings. Gap adjustment between the rotor breaker bars and breaker plates by manual or computer controlled systems adjusts the crushing gap so that product particle size distribution remains constant. HSIs have multi-turn breaker bars for extended life before changeout. Design Stedman Machine Company • 1-812-926-0038 • www.stedman-machine.com 3 simplicity offers safe and easy access for breaker bar replacement and access to all areas of the crushing chamber. Front-opening models eliminate the need for a crane in some cases. Rear-opening models can allow unique installation applications. HSIs have evolved from humble beginnings through improved crushing chamber design and metallurgy advancements to automation controls. Horizontal Shaft Impactors have proven they are capable of size reduction of all types of material sizes and hardness with minimal maintenance and excellent cubical particle size distribution control.